As the years Ralph Klein headed Alberta's government recede into history and memory, the enormity of the "Kleintastrophe" his policies wrought becomes ever clearer. While right-wing ideologues in the Wildrose and Progressive Conservative parties continue to portray the Klein years from 1992 to 2006 as a kind of economic nirvana, a hard-nosed analysis of the period shows it to have been chaotic, economically irresponsible and environmentally and socially destructive. Even Alberta's vaunted debt-free status turns out to have been essentially a public relations stunt, based on undermining essential public services and running up a huge infrastructure deficit -- analogous to calling yourself a good household manager because you're saving money by not fixing your home's leaky roof or crumbling foundation. Economic management under Klein boiled down to giving away the store to multinational energy corporations and leaving taxpayers to pick up the pieces when the oil and gas markets went south. Now veteran Calgary journalist, author and researcher Dr. Gillian Steward has made an important contribution to the overdue and necessary reassessment of Klein's leadership with the publication yesterday by the Edmonton-based Parkland Institute of a new report analyzing the oilsands policies of previous Alberta governments and the situation inherited by the NDP government led by Premier Rachel Notley. In Betting on Bitumen: Alberta's Energy Policies from Lougheed to Klein, Steward tracks policy development from the era of Peter Lougheed, which began in 1971. During that period, Alberta's first Progressive Conservative premier emphasized orderly development of the oilsands, a big government role to kick-start bitumen development, and determination to ensure oilsands extraction returned benefits to the people of Alberta. The Klein years, with their total capitulation to industry interests including a royalty policy that provided only nominal returns to the people who owned the resource, provided a dramatic contrast -- and set the stage for the economic challenges faced by the province in a period of falling world petroleum prices and rising environmental concern propelling worldwide efforts to move away from a carbon economy. In other words, Steward has charted exactly what former Alberta Liberal leader Dr. Kevin Taft was talking about about 20 years ago when he wrote Shredding the Public Interest: Ralph Klein and 25 Years of One-Party Government. History shows that Taft got it right. Klein responded at the time by calling him a "Communist," launching Taft's political career as leader of the Alberta Liberals, after which he is remembered as the best premier Alberta never had. Steward recounts how with the connivance of regional media the Klein government allowed an industry dominated "task force" on oilsands development to pass itself off in the public's mind as a neutral agency with ties to the government. In a sense, one supposes, it was tied to the government. The spokesman of what should be described as a lobby was the president of Syncrude Canada Ltd. It was organized by an oil industry trade group, the Alberta Chamber of Resources. The Klein government tossed aside the Lougheed government's good stewardship policies and adopted the "task force's" self-serving recommendations holus bolus, including a generic royalty regime the industry had been demanding for years. Steward concluded her report: "It is important for Albertans to understand this history if we are to avoid the pitfalls that come from giving control of development decisions about such an important resource to one stakeholder at the expense of the broader public interest." The report is part of the Corporate Mapping Project to research the corporate power of the fossil fuel industry in Canada, jointly led by the Parkland Institute, the University of Victoria and the B.C. branch of the Canadian Centre for Policy Alternatives, and supported by a grant from the Social Sciences and Humanities Research Council of Canada. 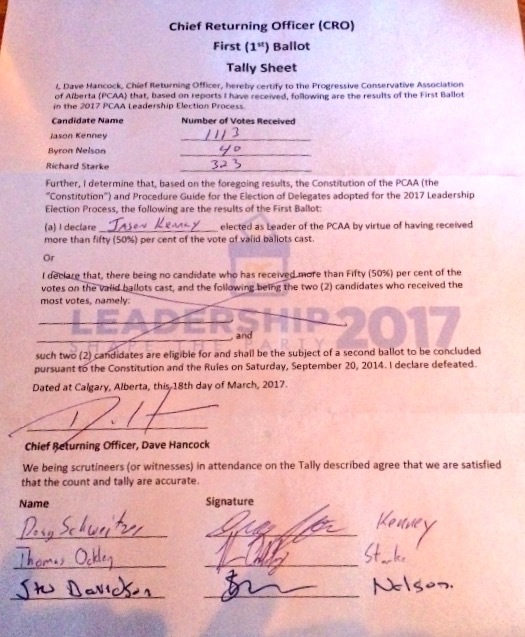 Doug Schweitzer, the Calgary lawyer who once pondered a run for the leadership of the Progressive Conservative Party but decided to support social conservative Jason Kenney instead, yesterday launched a bid to lead the United Conservative Party, Kenney's unite-the-right brainchild. Being the first thing of interest to happen in the race to lead the still-nonexistent party in many days, Schweitzer's announcement generated an enormous amount of ink -- or its digital equivalent, at any rate -- in The Globe and Mail yesterday. The CBC was similarly generous. In the Globe story, Schweitzer mildly knocked Kenney's social conservatism -- at least by implication -- telling the Globe's reporter that he's "fiscally conservative, socially moderate," and coming right out and saying he supports gay-straight alliances in schools, unlike you-know-who. Other than that, Schweitzer didn't provide much information about his platform, although he promised to do so later. His campaign website is startlingly uninformative. His slogan is "New Blue," which evocatively suggests the traditional fashion advice for brides: "Something Old; Something New; Something Borrowed; Something Blue." The announcement seems curious, given Schweitzer's previous support for Kenney, for whom he acted as a scrutineer in the PC leadership contest. Well, a feller can change his mind, can't he?